The Newsboy Cap is a casual cap similar in style to the flat cap. It is also known as the Baker Boy, Apple Cap, Eight Panel, Cabbie, Jay Gatsby (from The Great Gatsby), Fisherman’s Cap and Lundberg Stetson. 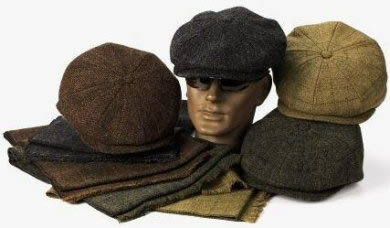 It has the same overall shape and stiff peak in front as a flat cap, but the body of the cap is rounder, fuller, and paneled with a button on top, and often with a button attaching the front to the brim as is sometimes the case with the flat cap. Some women are now wearing Newsboy Caps.